In this section you can find information about the data sets that have been used by the Astrodeep project, as well as links to all Astrodeep data products. A major goal of ASTRODEEP is to assemble and make worldwide available high quality data based on the deepest public surveys, motivated by the desire to understand the formation and evolution of galaxies and super-massive black holes from the very earliest times. Catalogs based on WFC3 images, with measurements at all other available wavelengths. Catalogs based on HSO images, with measurements at all other available wavelengths. 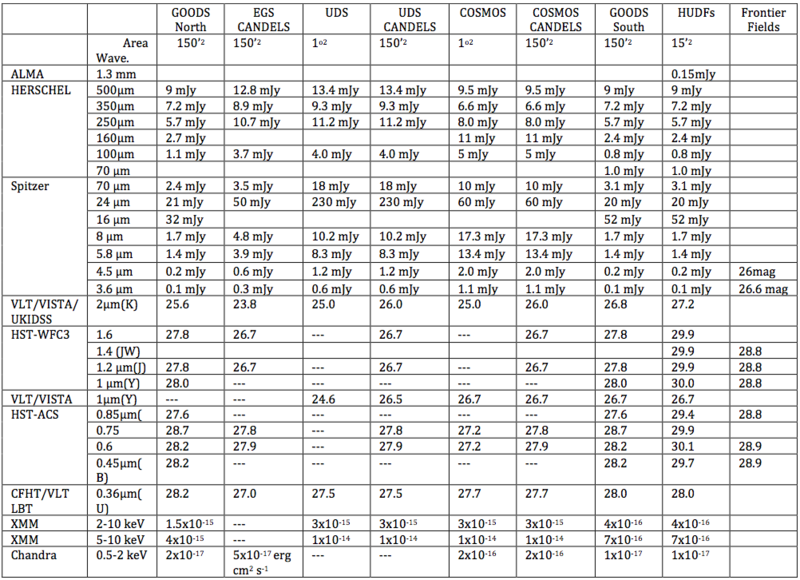 Catalogs based on XMM/Chandra images, with measurements at all other wavelengths. Catalogs with useful associated WFC3-Grism spectral measurements. Summary of the surveys that will be taken in consideration to build our database. For each field we provide the limiting depth (at 5σ) from the space and ground-­‐based instruments at various wavelengths: flux densities in μJy and mJy in the mid to far-­‐infrared, AB magnitudes in the UV/optical/near-­‐IR and flux densities in erg cm-­‐2 s-­‐1 in the X-­‐ray domain. The table includes only approved programs.